Equalizers can be great tools for getting exactly the tones you want. They allow you to sculpt and enhance your tones and bring out that little extra from pedals that might need a certain something. 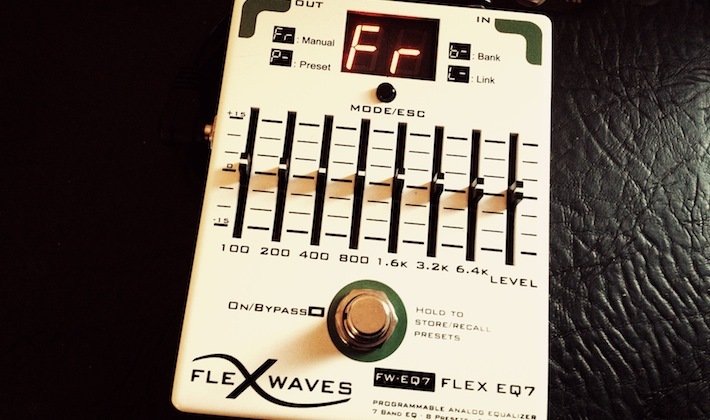 I recently got my hands on the Flexwaves Flex EQ7 – a programmable analog equalizer. Hereâ€™s my review. Iâ€™ve never really used EQ in my rig that much. To be honest, Iâ€™ve always thought of them as a hassle. Most of the EQ pedals that are available are either noisy or their circuit tend to add a little colouration, which is not what you want from an EQ. You also end up spending most of the gig on your knees, setting up new settings for each song. If you donâ€™t have an arsenal of EQs in your right, that is. Or, enter the Flexwaves Flex EQ7. The EQ7 is housed in a TRex sized box featuring true bypass switching and input for 9V Boss-style power adapter. The pedal feature an easy to see status display and a mini switch for choosing the different modes. Of course, being a seven band EQ, the Flex feature seven bands ranging from 100Hz to 6.4kHz, with boost/cut of +/- 15dB per band, as well as a volume band. Just some of the many settings you can improve your tones with. Left: boost the bass and dip the mids just a hint for your RAT and OD808/TS9. Right: great setting for boosting your Big Muffs or the output stage of your amp, placing the EQ7 in the amp’s effects loop. Whatâ€™s unique about the Flex EQ7 is that it has a 100% analog circuit and itâ€™s programmable. You can run the pedal in manual mode, adjusting on the fly, or set up 8 custom presets and recall the setting you want whenever you need it. With a minimum of controls, the pedal is easy to operate and navigate. If you use other FlexWaves pedals in your rig, you can also utilize a link mode, allowing one pedal to operate them all. See more about this feature on the FlexWaves site. So all the technical stuff aside – whatâ€™s it all about? Well, itâ€™s dead quiet for one and the signal is pure and clean. Compared to most other EQs that Iâ€™ve used, the response on the sliders is much more accurate and dynamic. Still though, being able to set up multiple presets is what makes this pedal unique and extremely versatile. With just one pedal, I can low cut some of my heavier sounding Big Muffs, compensate for the lacking low end on the RAT and OD808, give the cleans a little mids boost for more presence and attack, roll off the treble on some of the rhythms and boost the volume to drive the tube amp over the edge. All without a single adjustment of the sliders. How cool is that! Having a good equalizer in your bedroom setup, can do wonders for your tones. Regardless of your guitar, pedals and amp, you will loose much of the lower end and mid range when you play at low volume levels. Placing an EQ after your gains, will allow you to compensate for some of that loss and bring the smoothness back into you tones, with a little mids boost. Another cool trick is to place the EQ in the effects loop of your tube amp. This will drive the output tubes for that fat tube tone you get when playing loud. Try also a couple of dB mid range boost around 400hz and a slight dip around 6.4kHz to eliminate that fizzy top from your gains. I use a custom muff costalab, can I do something to make his tone close to the ram’s head with an eq? Depends on what pickups and amp you have. Not sure. Check out their site for details. Hi,I’m Joe Caruso & I am the US/Canada distributor for the Flex Waves pedals. I just wanted announce that the Flex EQ 7 as good as it was before is now even better! The newest version looks & works the same but has been given an even quieter noise floor! And this pedal was already masterful at that. The #4 mid scoop preset has been beefed up for metal players & the result is something that needs to be heard-forget about using a volume pedal if you are using this preset. FYI,I don’t sell on EBay. I have never tried to use it, as a clean booster.. Bjorn, do you have any comment or experience? Thanks from ILLY PROJECT band. oooo… this Flex EQ7 is very hard to find! Right now, on eBay, there’s none! I have a Boss GE-7 and also a Behringer EQ700 and I gotta tell ya, I like the Behringer very much! Hi Bjorn, thanks for the review! It would be so nice if they released a full or semi parametric version. Ibanez or Maxon or both (can’t remember) had such a model back in the 80’s/90’s but, unfortunately, it has been discontinued. Sadly, guitarists seem to prefer the ease of use of graphic units (though almost everyone who has tried a parametric one won’t go back). Bjorn, thanks for the review. What’s the price of this EQ7 pedal? Were can I buy it / did you buy it directly from FlexWaves? Is it really 100% analog? I have bought the EQ7 to replace my MXR equalizer and I have honestly noticed improvements in my tone. As stated in the article, the pedal is actually dead quiet, no matter how it’s set. The main difference I have noticed in comparison with the MXR is the clarity. The MXR, to be honest, sounded pretty good, but was extremely noisy, had power supplying issues, and tended to fatten up the tone to much, to the point where chords get muddy and you can’t distinguish a note from the other. The EQ7 on the other side is really precise, clear, and it doesn’t do anything you don’t ask for. It has a studio quality vibe to it. Having the ability to store and recall presets was also helpful to me, especially because when putting the pedal in a bag etc you tend to have all the sliders moved, so you lose their position. Presets gave my the ability to have a basic sound ready to go without spending 10 mins just to figure out where the sliders were. The preset feature is also really cool if you have more guitars (single coil – humbucker) or if you happen to also plug an acoustic guitar into your electric rig: you could have – say – P1=> Les Paul, P2 => Telly, P3=> Acoustic. In regard to the Boss Eq, I’m sure the analog section of the EQ7 is way better in terms of components, opamps, etc, not to mention the true bypass feature. There are some other good botique eq pedals on the market (some of which I have tried), but I found this one to have the best value for the money. You should definitely check out this product if you’re looking for a great eq! Hi Bjorn and Hi All, I bought a Boss GE-7 and was appalled at the level of noise that comes out of this pedal, the noise made the pedal unusable as far as I was concerned. So I sent it off to Pedalmods.com in the UK who preformed a “GE-7 Hi-Fi mod” on it. It is now as near as damn it silent. Chris was very professional to deal with and the turn around was very quick as I remember “had it done in 2010”. The mod including postage was under Â£40 and they still do it “I checked before I posted”. If you can’t get a FlexWaves and can put up with a dull brown pedal on your board but it will need modding first the GE-7 is OK…..until you can track down a very cool FlexWaves EQ-7. I have bought the Flex-EQ7 pedal about 6 months ago and it is one of the pedals that i use most now on my pedalboard: EQs are a great tools to sculpt the sound but it seems that for usabilty reasons guitarists use them a few. This pedal changed my opinion about them, happy to know that you’ve tried it; your website is a real hot-spot for musicians ! GE-7 can be a really useful EQ if and only if you replace some of the op-amps with high quality ones. Mods to do this are easily found with a Google search. If you’re capable of wielding a soldering iron and have about $10 to $15 for new parts, you can get a used GE-7 dirt cheap because of the noise problem, replace those gawd-awful noisy op-amps with quality ones and have a dead-silent pedal for sculpting your sound. I use mine to hard-cut everything but the mids for the “Wish You Were Here” old radio-tone. As well, I can’t get just the right tone on the dry solo from money without the GE-7. Other than that, it’s a covienient for pedal activated volume boost/cut. It sounds very interesting to me! I’ve checked the videos on the website and it sounds good. Thanks for the review because i didn’t know about that pedal. Please can you tell me if you i could use it with my clean electric sounds or with my acoustic gear too? Great timing Bjorn! I was looking at this very unit yesterday. I ditched my Boss GE-7 several years ago because of the noise, but lately I’ve been thinking that I could use an EQ. This unit was already on my short list, your review might be just the push I need. I was curious about the difficulty storing and retrieving presets. Can retrieval be done quickly and easily on a dark stage?